Wildlife Trust - Glaslyn Nature Reserve at Glaslyn Nature Reserve Nature ReserveGLASLYN is the flagship of the Montgomeryshire Wildlife Trust's nature reserves. It is currently the largest - at 216.5ha (540 acres), the wildest and of very considerable scientific importance. Its value for conservation is reflected in the bodies that supported its purchase by the Trust in 1982 - The Worldwide Fund for Nature, the Nature Conservancy Council, the Countryside Commission, the National Heritage Memorial Fund and Montgomeryshire District Council. All recognised that, as the best area of heather moorland within the Plynlimon Site of Special Scientific Interest, it was vital for it to pass into sympathetic ownership. There are five habitat types within the reserve. The largest is the area of undulating heather moorland north of the lake. This is the more important in view of the huge areas of heather moorland lost to the improvement of upland grazing and forestry in recent years. The vegetation is dominated by common heather (ling), but you will also find bell heather, cross-leaved heath and, in the same family (Ericacea), bilberry. A similar heathland shrub, but in a different family is crowberry with needle like leaves and hard black berries. To the west of the lake is a noticeably different area of grassland where at present grasses dominate. This patch was ploughed and re-seeded before the Trust bought the site, but is now being restored to heather moorland as part of a special regeneration project. Cotton Grass The southern portion of the reserve is a more varied mosaic of heather, rough grass and wet areas. The last are easily spotted by the extensive patches of bog moss (Sphagnum) with rushes and sedges. The sedges include the misleadingly named cotton grass - a sure indicator of very acid soil conditions. Not surprisingly this is also the habitat for the insectivorous sundew and butterwort, which can supplement their diet by catching insects on their sticky leaves. Look out for the oblong-leaved sundew as well as the more familiar round-leaved species. The lake, though a very prominent scenic feature, is generally poor in wildlife because of the very low nutrient supply in its acid waters. This is now a scarce habitat. But one plant which relishes this environment is quillwort - an unusual aquatic relative of the club mosses and ferns. it is restricted to the so-called oligotrophic (literally meaning few foods) lakes of the northern half of Britain. In the winter the lake sometimes attracts diving ducks, notably goldeneye, and occasionally has wintering Greenland white-fronted geese. Although characterised by its vegetation, this reserve is also very important for upland bird-life. Heather is the food plant for red grouse, but they prefer the tender shoots of young plants. Heather management therefore continues to involve controlled burning and cutting of the heather, and a low level of grazing. Other birds such as the short-eared owl however, like some older, taller heather for nesting in, so a mosaic of treatment must be employed. Other regular moorland birds on the reserve include meadow pipits (the commonest "little brown birds"), skylarks - a species in rapid decline nationally wheatears and ring ouzels (the "mountain blackbird") looking much like its garden cousin but the male has a white bib. This is also golden plover country, and the Trust hopes its management will encourage these upland waders. You may see birds of prey hunting over the reserve, including red kite with its distinctive notched tail, merlin which are our smallest birds of prey and fly low and fast just above the ground, and peregrine which swoop down at great speed on their prey. The final habitat contributing to the interest of the reserve is the ravine to the north. You are asked to keep out of this area where the waters of the Afon Dulas have cut deeply down through the shaly rock, leaving treacherously steep slopes. ACCESS : Open at all times. Take extreme care in poor weather. Keep out of the ravine. PARKING : At the entrance to the reserve down track off metalled road. TIME : It will take you at least a couple of hours to get the full flavour of this site. 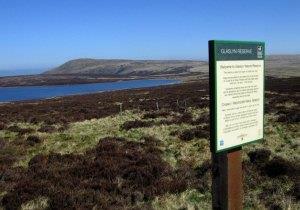 GLASLYN is the flagship of the Montgomeryshire Wildlife Trust's nature reserves. It is currently the largest - at 216.5ha (540 acres), the wildest and of very considerable scientific importance. Glaslyn is found at grid reference SN826941, clearly signed off the minor road between the B4518 near Staylittle and the A489 at Machynlleth. This reserve is truly out in the wilds, but can be reached from several directions depending on your starting point. It is approached down a track, south off the minor road that runs steeply over the hills between the B4518 (Llanidloes to Llanbrynmair) and the A489 north of Machynlleth. Go down the track for about a mile off the minor road and park at the reserve entrance.